His Word is Truth: When Kingdom Growth Doesn't Look Like Church Growth: Did Our Church Plant Fail? 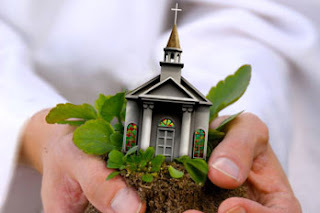 When Kingdom Growth Doesn't Look Like Church Growth: Did Our Church Plant Fail? Our 11 year old church plant is going through the difficult process of closing down, but our church plant has not failed. That word is often used to describe a church plant that “doesn’t make it.” The statistic normally goes something like this: a certain percentage of all church plants fail in the first 5 years or 10 years. That’s the key word in those stats - fail. And, I suppose, if someone is gathering the raw data on church plants, our church will be added to a list that “failed” within about 10 years. But, our story is so much more than raw data; some simple binary glance at whether the church is still open or closed. For God’s own good reasons, he chose to grow his kingdom through our church in ways that meant our church itself didn’t grow. In the early days of our church, meeting in a school building with metal folding chairs, we had a number of families travelling from a neighboring city about 40 minutes to the south. They faithfully joined our body for the first years, but sensed a longing for a church like ours in their own community. We rejoiced in that desire and as more families from Goldsboro began coming to us, it became clear that the right thing for us to do would be to plant a church in Goldsboro. But, that would mean only about 4 years into our existence we would be sending out about a third of our current members and attenders. And, let’s be honest, it would also mean sending out a large portion of our budget. But, we rejoiced at the opportunity and joyfully sent them out with a large lump sum of money to get them started. By God’s grace, they have flourished and recently purchased a building; which, if you’ve ever been involved in a church plant would make you want to march around the building chanting - no more setup! We’re thankful for how God has continued to bless them and for the faithful gospel presence Crossway Church brought to Goldsboro. Kingdom Growth. In addition to being able to start a church in Goldsboro, I last counted 6 men that we’ve been able to send out into various pastoral roles in other churches. God would bring them and their families to us for a season and after a few years he chose to send them to other places where they could multiply his kingdom in other cities. We also recently had a family move to the Philippines to be close to family where they are intentionally seeking to spread the gospel to their new community. We had another faithful family move to California to work at a Christian Camp where they are striving to impact the lives of thousands of people that come through the camp every year. Kingdom Growth. And, of course, there’s the immeasurable impact that the faithful proclamation of the Word of God has had on the hearts of our people for the past 11 years. We watched it sustain us through many personal trials, heartaches, and difficulties. We’ve wept together and we’ve rejoiced together. Kingdom Growth. We witnessed children trusting in Christ and co-workers doing the same. It’s a glorious celebration to watch a young man raised in a Jehovah’s Witness family be delivered from the domain of darkness and transferred to the Kingdom of God’s beloved Son. He took a job in another city, but has remained faithful, by God’s grace, and pursued finding a faithful church. Kingdom Growth. As we sent families out, God would bring others to us. So, the story of our church has been never really to grow past 40-45 members and, sometimes, like now, a lot less. I’m reminded of Paul’s words to the Philippian church - and I wonder if it may not apply to our church. “Even if am to be poured out as a drink offering upon the sacrificial offering of your faith, I am glad and rejoice with you all. Likewise, you also should be glad and rejoice with me” (Philippians 2:17-18). Christ Community Church, you have been poured out as a drink offering upon the sacrificial offering of the faith of many - far beyond what you’ll ever see or know in this life. But, the one thing I know without an inkling of doubt in my soul is that you have not failed. I’m thankful that I got to be your pastor. And, I’m thankful I get to be your pastor for a few months longer until God makes clear his next place for me. I don’t know where that will be right now, but I know my time with you has forever changed me because you pointed me to Christ as much as I strove to point you to Him. I love you Christ Community Church. Kingdom Growth. So beautifully written. Such truth and encouragement. Thank you, Jonathan!